Off the coast of Westport, Connecticut, there is an archipelago of small islands. The climate of the islands is oceanic, meaning they are warmer in the fall and winter than the mainland. Increasingly, the island’s traditionally seasonal populations take advantage of the climate and stay long past Labor Day weekend. Instead of the islands being known as summer getaways, residents “get away” year-round. The new owners of this home, for instance. The beach cottage was a mash-up of 40 years of renovations done by a revolving door of residents. 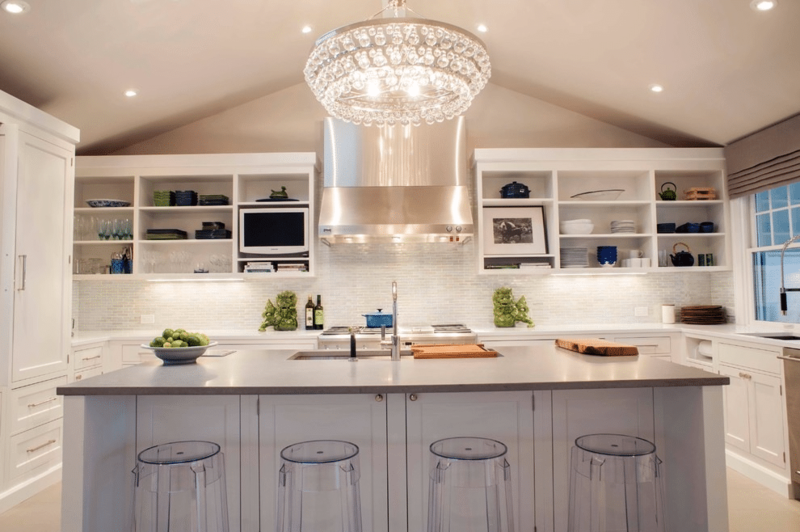 The cottage was taken down almost to its bare bones and transformed into a home with a very personalized interior design. Throughout, you will see the interplay of appealingly sharp modernity with intriguing curiosities gathered during international travels. The foyer is quite an introduction to the home. It takes “first impression” to a whole other level. Since we’re standing close to the abstract painting, it is the right amount of color to engage rather than overwhelm. 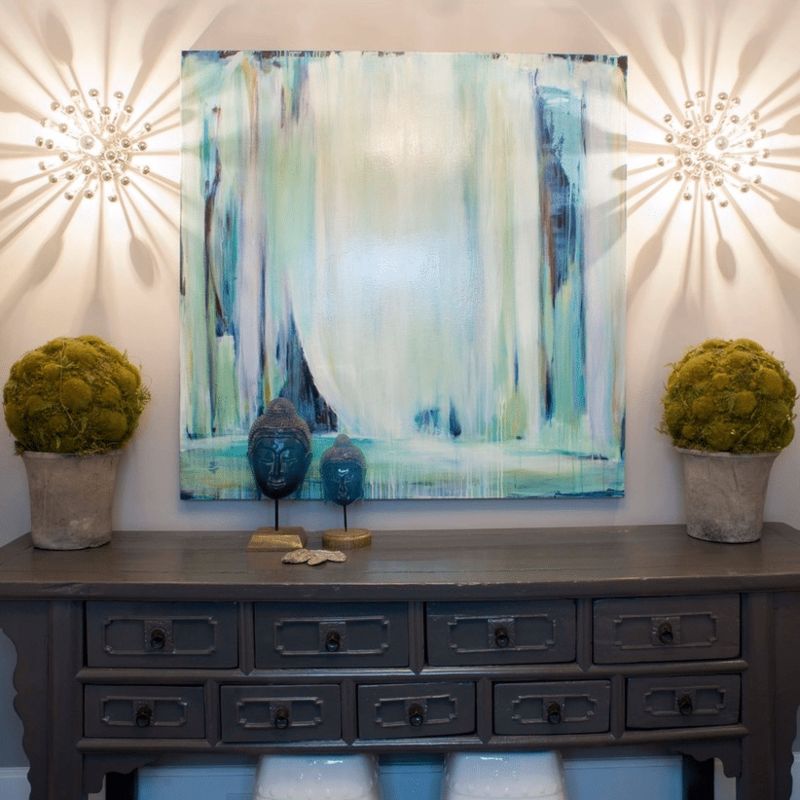 On either side of the painting are ultra-modern anemone sconces. The exposed bulbs, tipped in silver, reflect off polished nickel. Then, against the modernist background, we see the Chinese console table with glazed masks of Buddha. The open floor plan makes an ideal situation for entertaining. Here we see the color scheme that will continue throughout the home, white and gray (light pewter) walls that provide a warm, neutral backdrop for the colorful art, artifacts and accessories that await us. The white Shaker-style cabinets are relieved of any possible danger of monotony with open shelves on which ordinary housewares provide a “frieze” of color. The island is a chef’s dream with a second sink and a near-indestructible quartz countertop. The clear acrylic bar stools are tucked into their nook—out of the way, but convenient. The glittering Bling chandelier with multiple tiers of round- and pear-shaped glass droplets adds an elegant glamor to the kitchen. 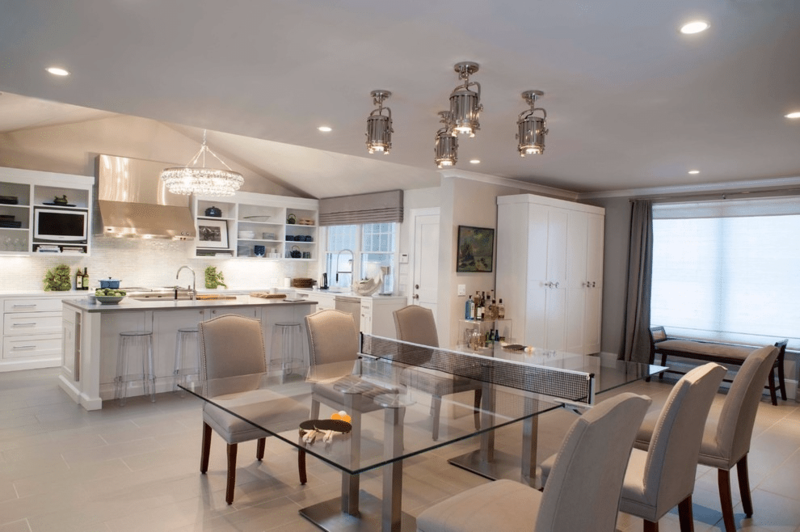 The dining area is lit by cutting-edge Montauk pendant lamps and recessed lighting, an arrangement that works better for entertaining and, for that matter, a ping pong game. Yes, ping pong. See the net on the dining table? See the paddles? As unimaginable as it may be, the chic glass table doubles as a regulation-sized ping pong table, all 300 pounds of its polished edge glass. The family room has a crispness to it with the straight lines of the shelves, coffee table and shelter arm sofa. The cadet blue of the sofa perfectly balances the wall with the built-in television and electric fireplace. The rug is in rather understated shades of blue; the artistry lies in the patchwork of elaborate designs. The ottomans are tucked away under the shelves, similar to the acrylic bar stools—extra seating that is not cluttering up the room, but convenient when needed. 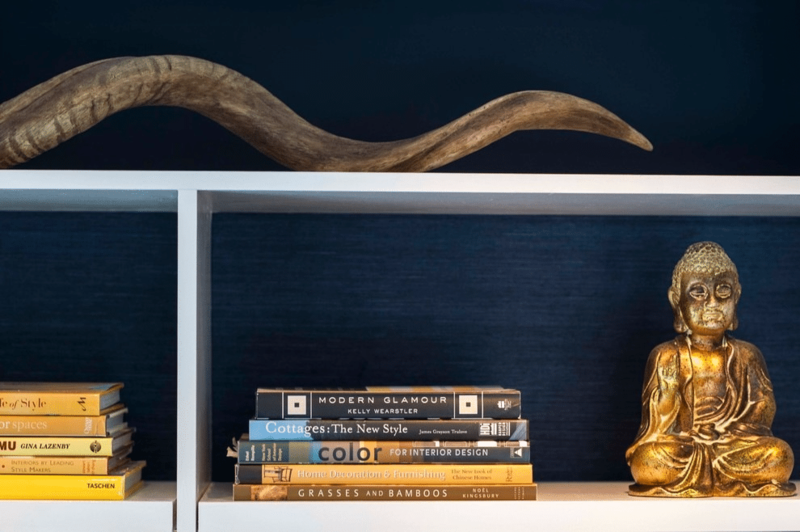 This is an example of a meticulous attention to detail: the back walls of the bookcases are papered in navy grass cloth. An added touch such as that is what makes the difference in a home being decorated rather than merely furnished. This master bedroom appears to be a re-creation, or perhaps a homage, to times spent in faraway lands. 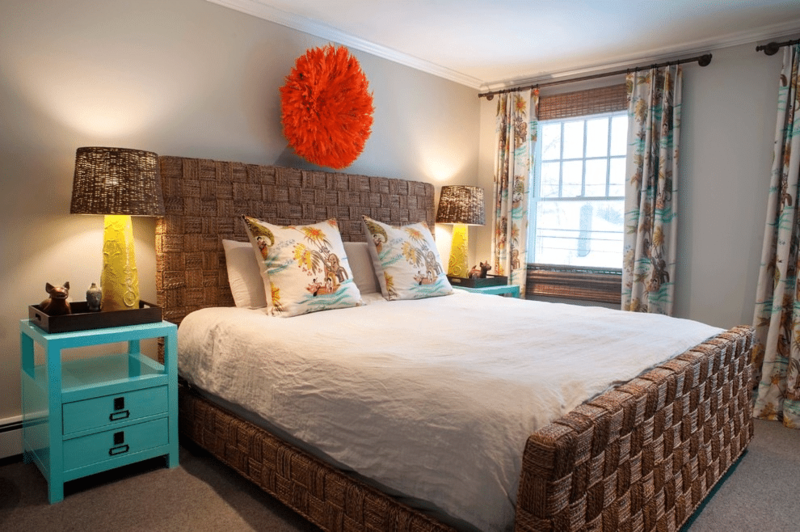 The hardwood of the bed is covered with a weave of braided sea grass, and that same earthiness is seen in the faux wood window coverings and burlap lamp shades. For a brilliant pop of color, what’s better than an orange African Juju hat! 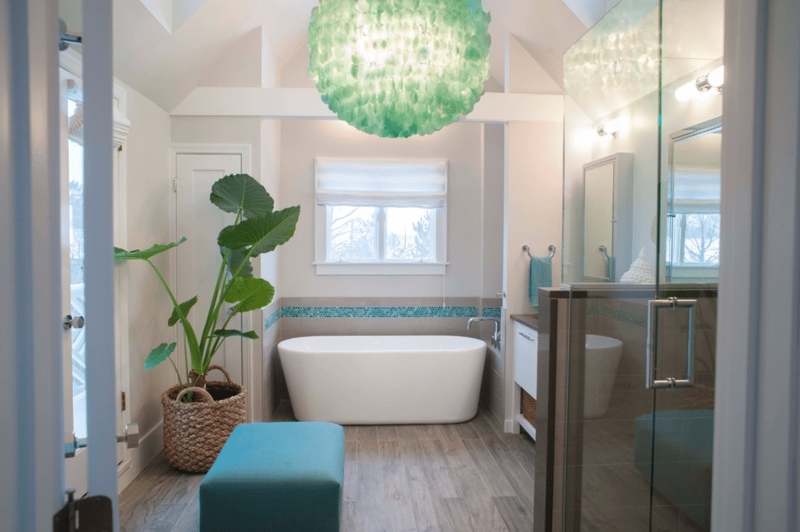 Walk across the heated floor covered with driftwood porcelain tile to the soaking tub. Talk about luxury. The tub is acrylic, stronger and easier to install than your Grandma’s tub, as well as warmer and more comfortable. This chandelier is made of capiz shells. New to me, but apparently the shells of windowpane oysters have been used for thousands of years as durable and translucent substitutes for glass. After touring this home, my “home décor wish list” has run off the page. There are many “most favorite’s,” certainly the glass dining/ping pong table and the exotic artifacts in just the right places. But the idea that I will treasure (and use) forever is the use of everyday objects as color accents: the visible housewares in the kitchen, the liquor bottles between the kitchen and dining area, even the innovative arrangement of books in the family room. Sometimes the simplest elements are among the most significant.